Graphic courtesy of Wood River Land Trust This graphic shows the patchwork of land ownership in the area of the Howard Preserve in Bellevue. 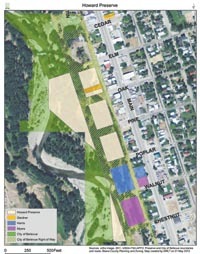 The green and tan blocks are public property, and the blue block indicates the recent acquisition. The pink and orange blocks are still private property adjacent to the public preserve. Though a 1.7-acre parcel that has been added to the Howard Preserve riverfront area in Bellevue might not seem like much, residents and Wood River Land Trust staff say the little piece of land will make a big difference to the area. Land Trust Executive Director Scott Boettger said the organization recently closed on a process that began in July, when he spotted a listing in the Idaho Mountain Express for eight lots in downtown Bellevue—including a parcel adjacent to the existing preserve. Boettger said that at one point, the property—which includes two Main Street lots—was listed for $700,000. The Land Trust was able to buy it for less than $100,000. Boettger said the parcel was owned by David Harris, a Bellevue sculptor who had planned to turn the land into an artist’s compound. “It was a great vision, but he was never able to pull it off,” he said. Boettger said the 1.7 acre parcel is still owned by the Land Trust, not the city, so technically it’s not part of the Howard Preserve. However, it’s managed as part of the preserve and helps to connect a few hiking trails near the south end that previously had crossed private property. “There’s always been this difficulty” with following the trails, he said. Sara Burns, co-organizer of the Bellevue Haunted Forest held at the preserve each year, said the event has to skirt the adjacent private property—and even when the event is not occurring, there is some difficulty with users figuring out what parts of the riverfront area are public land. The Howard Preserve is a parcel of land totaling nearly 13 acres one block west of Main Street in Bellevue along the Big Wood River. Boettger said the area is a riparian habitat for bald eagles in the winter, along with sculpin, yellow-billed cuckoo, moose, mountain lions and sought-after morel mushrooms. The property was originally acquired by the Wood River Land Trust in 2004 as a bargain sale from the Howard family, but was later transferred to the city of Bellevue for use as a public park. Bellevue, along with a volunteer group known as the Friends of the Howard Preserve and the Land Trust, collaborate to maintain the preserve. Burns said the Bellevue Haunted Forest provides $2,500 a year for the preserve’s maintenance, which includes weed control, signs and trail maintenance. Boettger said that in addition to maintenance, the Land Trust has plans to seek grant funding to restore one old trail that follows the riverbank. As for the two Main Street lots, Boettger said the Land Trust has no plans to develop them. Rather, the organization will try to trade that developable property for other land in the area with conservation value.